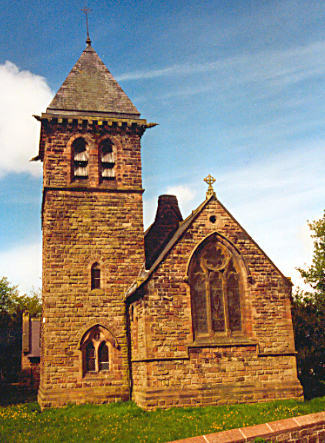 The district church of St. Bartholomew, at Sealand, in the parish of Hawarden, was consecrated on the 15th of October 1867. "The church is designed in the Early Gothic style. It is constructed of stone from the Helsby quarries, the interior being finished with ashlar. The plan consists of a nave, 62 feet by 26 feet; chancel, 24 feet by 17 feet; a small transept on the north side is to contain the organ, and the vestry is under the tower on the south side of the chancel. The tower is 65 feet high, surmounted by a metal cross, but at present only contains one bell. The whole of the roof timbers and doors are of oak ....."
For family history information about the church, visit the GenUKI Sealand page.